First, I like the feeling of being comfortable in all areas of my home, not just warm in some areas and cold in others. Usually, typical heating systems are warm near the heat source then cold near windows or at the end of the system. Radiant heat is evenly dispersed throughout the home so there are no noticeable differences in different spots. Also, I don’t need to keep my feet as warm as with convective. I can sit or play with the kids on the floor without worrying about being cold. I do love a good fireplace, but we typically don’t use them to heat our homes these days. Second, and equally important, is the efficiency of the system. 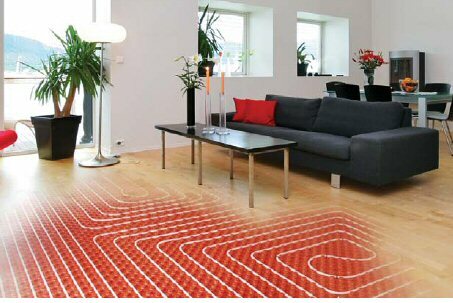 Studies conducted by the American Society of Heating, Refrigeration and Air Conditioning Engineers (ASHRAE) indicate that with radiant heating systems people can be comfortable at temperatures 6°F to 8°F lower than with convective systems. Not only that, but take a look at the graphic. With radiant heat, the lower living area is where the heat is focused, whereas with convective, the air is heated and consequently it rises to the ceiling. In addition, convective heat is placed on outside walls. This temperature differential causes cold outside air to be drawn in. the bigger the difference between outside and inside temperature, the bigger the air infiltration. It then takes more energy to effectively heat the lower living area. … As a result, the thermostat can be set 6°F to 8°F lower, and use less energy. It is estimated that each degree the temperature is lowered saves between 3% – 5% on energy costs. That equates to 18% – 40% savings. Other benefits of radiant floor heat include maintaining the humidity level. It does not dry out the air as does convective. It is also easier to install, and can be increased in sections. So if you are adding an addition or redoing your whole heating system, it just works. There are two kinds of Radiant Heat for flooring, electric or water. Electric is scrolled through a mesh which is then laid out under flooring in sections and wired accordingly. Water based is installed via flexible tubing that can be run under a new floor or even through joists under an existing floor. Water has three added benefits. First, it can be installed under existing flooring without having to rip it up. Second, it can be installed under any kind of flooring, whereas electric may have an issue under a rug. Third, it can be connected to a water heater or even a solar heating system. In the end, radiant heat in your floor is better all around. Call us today to discuss the cost vs. savings you can realize by installing this very ‘green’ idea!